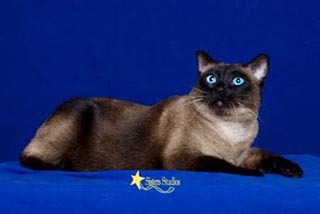 Bathsheba is a chocolate point Balinese with entrancing blue eyes. She is very talkative and meows loudly when carrying her toys. She has a very sweet personality and follows me wherever I go in the house. Always wants to be in my lap. Her kittens are gorgeous and have her very lovable personality. 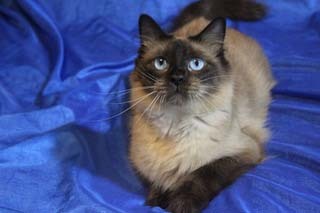 Topaz is a seal point Balinese, very sweet and so so lovable! She produces drop dead goreous kittens that have her very sweet personality. She loves everyone she meets, and non stop purrs when you pick her up. 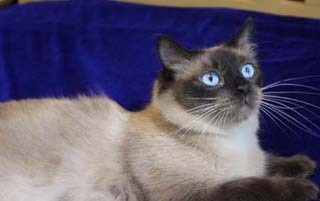 Atara is a gorgeous seal point girl. So talkative and loud when she wants attention. She carries very old style Siamese bloodlines. 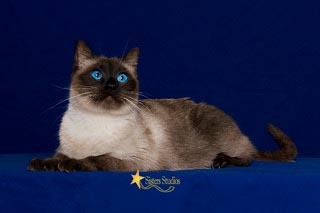 Her kittens are outstanding seal points and chocolate points, with her outgoing personality and deep blue eyes. 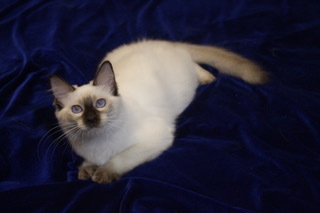 Piper is a gorgeous seal point girl and produces beautiful seal point kittens, my favorite color. Her kittens have very sweet personalities and her dark seal point color is so rich looking like a mink coat. She has crystal blue eyes that will cause you to be wrapped around their little paws. She loves her treats and will not leave you alone until you give her some; she can be sound asleep and wake up when she hears the bag open up. She is a great snuggle kitty and sleeps under the covers. Jax is a very sweet boy and loud talker. He carries very rare Old Stye Siamese bloodlines. 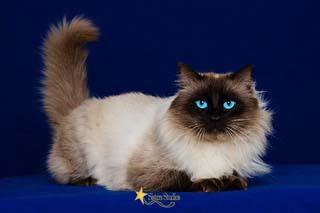 Produces outstanding kittens with his stunning blue eyes and very sweet dispositions. He is as playful as his kittens and loves water, constantly plays in his water bowel, puts toys in the water and splashing with his paws till he knocks it over. Very charming kitty and so lovable. Baku is a very outgoing boy, he has such a lovable kitty and very loud talker. He came to me from Stormhaven cattery to add new bloodlines to my cattery. His kittens are very beautiful and breathtaking and have such sweet personality's. He is a great sire and such a charmer. Baku produces very round Apple headed and stocky kittens with very sweet personalities he carries very old imported "Old Style" Siamese bloodlines and produces gorgeous seal points and chocolate points. 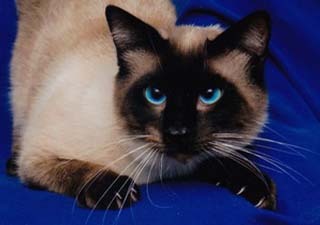 Sebastian is my Balinese seal point sire. He produces seal, chocolate, lilac and blue points. His kittens have gorgeous deep blue eyes and silky fur so soft. Sebastian has a childlike wonder and loves everyone he meets, so lovable and sweet. He chirps when he sees you and meows very loudly if you do not give him attention. His kittens are so lovely and have his great personality.